Das Robot Framework ist ein generisches Framework zur Durchführung von automatisierten Softwaretests, v.a. Akzeptanztests. Robot verwendet für das Keyword- Driven Testing eine tabellenartige Struktur zur Verwaltung der Testdaten. Selenium2Library ermöglicht, die Selenium 2 (WebDriver)-Bibliothek im Robot-Framework zu verwenden. Weitere Informationen zur Selenium2Library finden Sie im Wiki. Damit wird neben plone.app.testing noch die robotsuite und die robotframework- selenium2library zum Testen installiert. Set up plone.testing.z2.Startup in 0.394 seconds. Set up plone.app.testing.layers.PloneFixture in 10.463 seconds. Set up vs.registration.testing.VsregistrationLayer in 0.464 seconds. 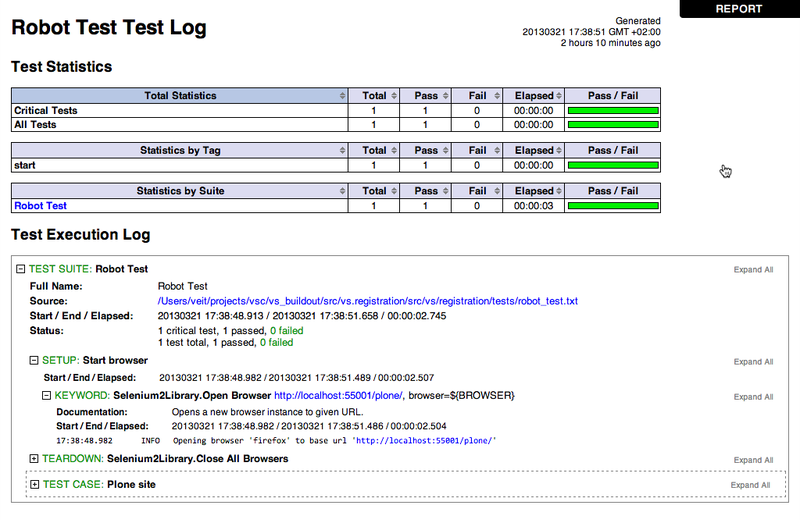 Set up plone.testing.z2.ZServer in 0.503 seconds. Set up vs.registration.testing.VsregistrationLayer:Functional in 0.000 seconds. Ran 1 tests with 0 failures and 0 errors in 3.026 seconds. Tear down vs.registration.testing.VsregistrationLayer:Functional in 0.000 seconds. Tear down plone.testing.z2.ZServer in 5.152 seconds. Set up vs.registration.testing.VsregistrationLayer:Integration in 0.000 seconds. Ran 1 tests with 0 failures and 0 errors in 0.004 seconds. Tear down vs.registration.testing.VsregistrationLayer:Integration in 0.000 seconds. Tear down vs.registration.testing.VsregistrationLayer in 0.002 seconds. Tear down plone.app.testing.layers.PloneFixture in 0.092 seconds. Tear down plone.testing.zca.LayerCleanup in 0.004 seconds. Total: 2 tests, 0 failures, 0 errors in 20.510 seconds.